Visit our Writers’ Spotlight section to learn more about some of the industry’s up-and coming talents. Greg Simison wrote a weekly humor column for a small newspaper in the Okanagan Valley for eight years. Eventually, an angry mob of torch-waving villagers came to their senses and drove him out of town. He stopped running when he reached Moose Jaw, Saskatchewan, where they’ve yet to catch up with him. 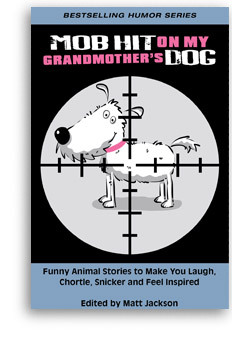 Prepare for plenty of laughs, chortles, snickers and guffaws as Summit Studios publishes its first ever collection of funny animal stories. What does a golden lab that steals laundry off a neighbor’s clothesline have in common with a mynah bird that can imitate a flushing toilet? Or what does a “pet” wasp with a taste for shrimp have in common with an old boxer with a taste for caviar? What they share is a place in the pages of this book: an unforgettable collection of the most hilarious and outrageous animal stories you are ever likely to read about. Click here for more information about Mob Hit on My Grandmother’s Dog. Or visit our Writers' Spotlight section to read a short excerpt. Spending time at the cottage is arguably the quintessential summer experience. Whether one travels there to swim in the lake, go fishing, pick berries, or lie out on the dock and watch the stars appear one after another, there’s nothing quite like those lazy weekends spent in Cottage Country. 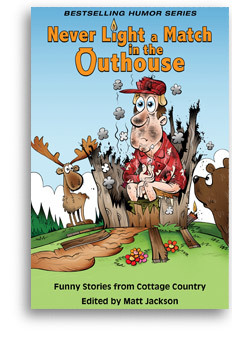 From the publisher that brought you bestselling humor titles such as Mugged by a Moose and A Beaver is Eating My Canoe, you can now enjoy a collection of hilarious stories about the lighter side of the cottaging experience. Click here for more information about Never Light a Match in the Outhouse. Or visit our Writers' Spotlight section to read a short excerpt.